They have been sold up to 250,000 times on the ThemeForest marketplace…But how fast are those famous WordPress themes? Dareboost have been testing 8 of these best sellers themes by monitoring their demo pages for several months. Here are the results. Even if these WordPress themes are all sold around $60, they do not have the same value in matter of web performance: Through our tests, conducted from October 7th to December 7th, their average Speed Index goes from 2131ms to… 6130ms for the last theme of our ranking. 3 times slower than the first one! Beware not to make snap judgments from this study: we have tested the demo version of these themes. Demos aim at showcasing all the features and, at the same time, to convince people to buy them! That may drive to a real escalation . Still, the goal remain to convince people to buy a theme. And if we focus on the server response time (TTFB), convincing the customers does not sound like an easy matter: half of the tested themes show server response times over 1 second (where Google recommends less than 200ms). Betheme is doing pretty well with 187ms, followed by Enfold (233 ms) and Udesign (277ms). The last 3 are showing very close results: Avada, Salient and Bridge respectively provide the first octet of data within 1332, 1347 and 1388ms. The page weight is also another interesting matter when it comes to web performance. Two of the studied themes are overflowing the 4MB threshold, widely using multimedia content. Again Avada (4,2MB) is among the last ones, accompanied by X-integrity that explodes over 6MB, due to an heavy video. These themes may present a huge amount of features, effects and layouts within a single demo page, and why not? They aim to showcase their potential. Unfortunately, it often results in a significant amount of work to sort out what will really be necessary for your needs and get proper performance. This important cleaning step is rarely anticipated, as most of the public of these themes is looking for a simple and cheap ready-to-use solution, and won’t consider such kind of extra work. 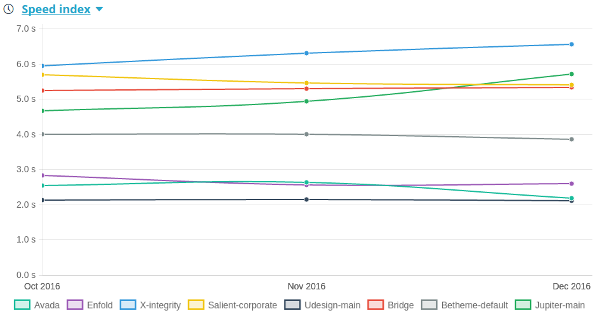 Finally, if we look after the dareboost quality score, they spread from 53% (Bridge) to 67% (Udesign): no good performer to be found here. Even if using a WordPress optimization plugin can benefit to your website performances using one of these themes by fixing some mistakes, do not forget that performance and quality should be one important criteria to choose your next theme, at least to be able to anticipate the efforts you’ll have to deploy in order to clean the theme before using it for your very own needs. That’s another good reason to make use of Dareboost allowing to analyze any web page for a comprehensive audit within a few seconds!